Continuing his crusade against Prime Minister Narendra Modi, Assam parliamentarian Gaurav Gogoi on Monday said the purchase of Rafale fighter planes under a private company is ‘betrayal of Indian defence’ as well as violation of defence procurement procedures and misuse of finance by the NDA Government. Gaurav Gogoi made these allegations against Modi during a second press conference in two consecutive days held at Manipur Pradesh Congress Commitee office in Imphal on Monday. He said before understanding the scam, the central government has to understand the defence requirement of the country against the external threat and aggression. He said the deal of purchasing Rafale fighter jets was initiated by the then UPA government. During the then negotiation with Dassault Aviation, France, out of the 126 fighter jets, 18 jets have to be bought immediately and the remaining 108 jets planes was supposed to be manufactured in India with collaboration from Dassault Aviation and Hindustan Aeronautics Limited (HAL), he added. Gogoi alleged that instead of following the deal made between the then UPA Government and France government, Modi renegotiated the deal all by himself. He also added that the UPA made the deal with Rs 526.19 crore per jet plane, but Modi renegotiated the deal at Rs 1670.70 crore per jet plane without consulting the Defence Ministry. He said the unilateral purchase of 36 Rafale aircrafts by the Prime Minister ‘suffers from deliberate non-disclosure of purchase price of these aircrafts, violation of the mandatory provisions of the defence procurement procedure, absence of prior clearance from cabinet committee on security, squandering the national interest on transfer of technology to HAL, deliberately ignoring the price of reducing offer by 20 percent of Eurofighter Typhoon and not calling for fresh bids to get the lowest price’. 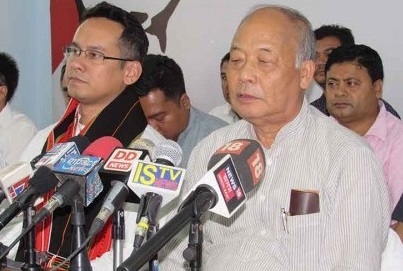 Gaurav Gogoi who is the general secretary in-charge of West Bengal and Andaman, All India Congress Committee and permanent invitee of Congress Working Committee (CWC) was flanked by former Manipur Chief Minister Okram Ibobi Singh and other leaders of Manipur Congress Committee during the press interaction.